Trip to M&S today; lemon ginger and Ginseng tea in a pot, cappuccino cake and Bakewell slice. I was hoping the ginseng would wake me up but not today! Cake was lovely. 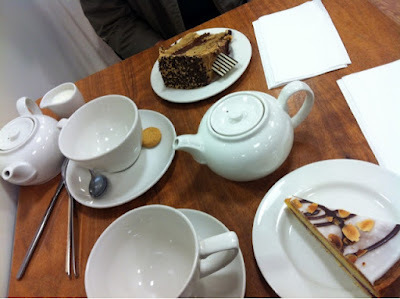 We were excited to notice a couple with an afternoon tea cake stand and on looking at the menu again I saw they now do Afternoon Tea for two for £10! I wonder if this is a Jubilee thing or a permanent fixture!